Christmas Lolly Mix a delicious mix of foam lollies and soft jubes in festive shapes. Perfect for Christmas table or just snack in a bowl. 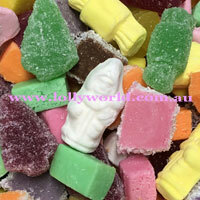 Entertain your guests this Christmas with this wonderful mix of lollies by Australian company Smyths. And it’s gluten free.